The Arizer Air II Herb Vaporizer Review-Air Force! 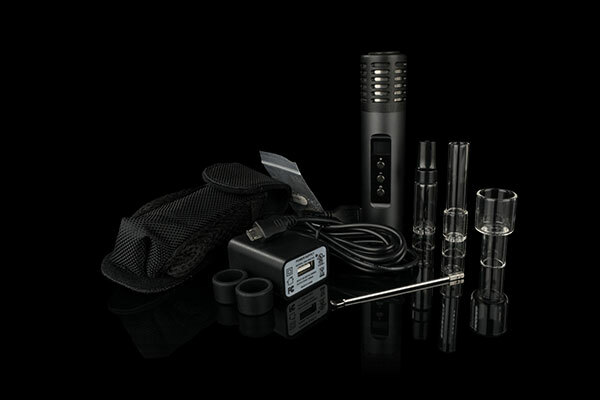 Hot on the heals of the release of the Solo II, the renowned Canadian manufacturer Arizer has just announced the release of the new Air II herb vaporizer. Arizer hasn’t started shipping the Air II to stores, but we understand that we should receive our inventory as early as Thanksgiving! But thanks to the good folks at Arizer, we did receive samples of their latest addition to the family to try out so we could tell you all about it! 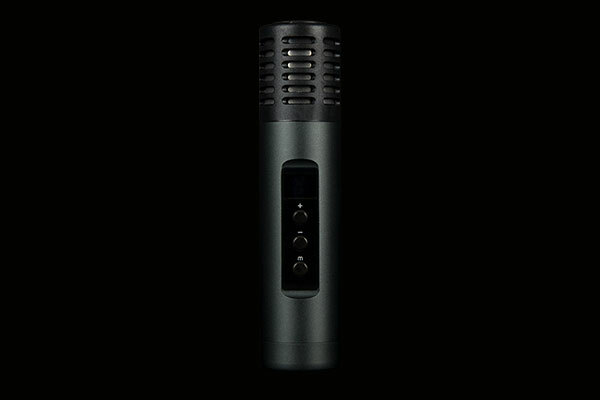 The Air II is the same size as the original Air, retaining its portability and discretion, and has the same high quality components, fit and feel that I’ve come to love and expect from Arizer; there’s something to be said for Made-in-Canada products, and everything from the casing, the oven, the glass stems and the carrying case are top notch. The Air II has a nice, streamlined, clean look in two great colours, Carbon Black and Mystic Blue. The new LED display is easy to read and the three buttons on the front look great, are well positioned and easy to use. One nice change is that the micro USB charging port has been moved from the bottom to the back. so the unit can be upright while charging. The addition of a high quality 18650 Lithium Ion battery gives the Air II a lot of punch; while it takes about 75 seconds to get the oven temperature from room temperature to 220 degrees C, the operating time is about 90 minutes keeping the powerful oven and you going for a good long while! A really great feature is that you can use the Air II while it is charging, once it has charged for about 15 to 20 minutes. When not in use, the battery takes about 3 hours to charge completely. Keeping good care of the battery helps it last for hundreds of charges and years of use. Dropping the battery will dramatically shorten its life and could create a dangerous internal short. Lithium Ion batteries, and especially powerhouses like the new Air II battery should be treated with care to keep them safe and effective. The Air II is super easy to use, with virtually no learning curve…it took me only one run through to feel totally comfortable. To turn the unit on, just hold down the menu and – button down for 6 seconds, which is the default power-on setting. When the unit turns on, it will beep once and say Hi with a happy-face. Once on, pressing any button will start the Air II oven heating to the last set-point that was used, showing its heating progress on the display. A nice improvement with the Air II is that you can adjust a lot of the settings. 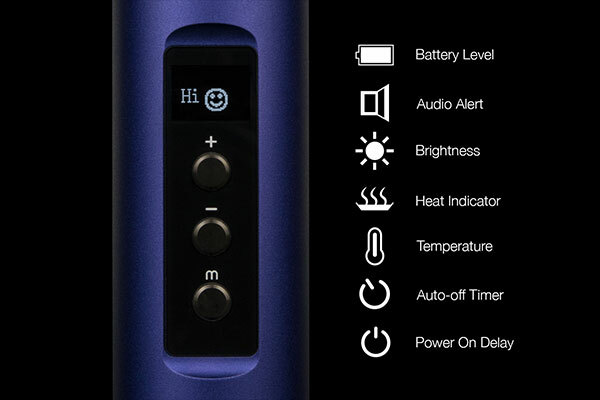 The menu button lets you scroll through all of the available functions, including beep volume, display brightness, power-on time and auto-off time, and temperature in degrees C or F.
The temperature control with the Air II is unsurpassed especially in a unit this small, adjustable in one (1) or ten (10) degree increments from 50 degrees C to 220 degrees C, so you can find the perfect temperature for you and your botanical. I found the Air II really nice to use, and I love the new battery indicator which is always showing on the screen. 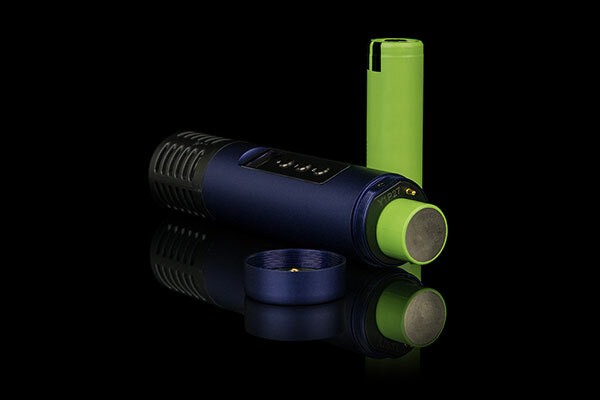 When the unit starts to get low on charge, just plug it in and keep on vaping! The Air II does not disappoint. The powerful oven delivers fantastic vapour that is consistent with what we’ve all come to expect from Arizer. As a new plus, the air flow has been significantly improved providing just the right amount of resistance to let the oven stay at temperature, but free enough to allow a nice smooth inhale of cool, wonderfully rich, pure flavour with nothing ‘on the side’ to taint the taste. I found just lifting the stem slightly off the floor of the oven exposed the airflow dimples in the bottom further improved air flow. 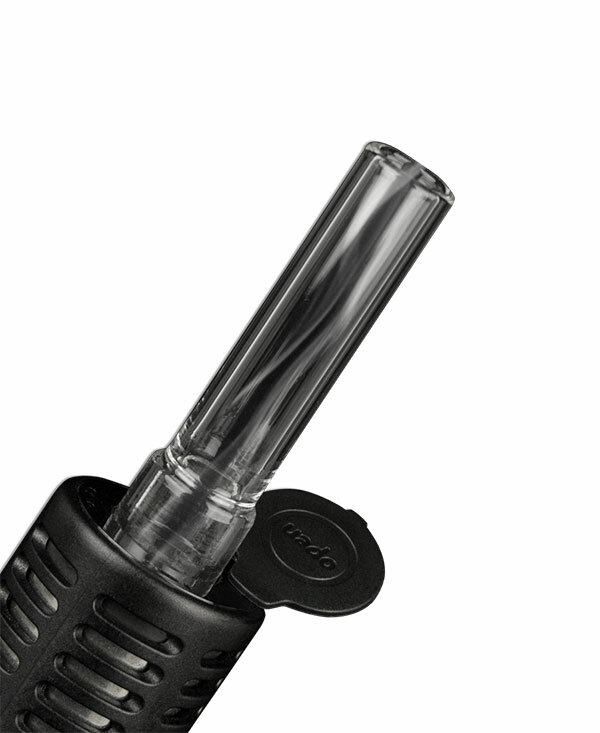 Packing the glass stem more or less tightly also changes the airflow and the richness of the vape. I like leaving it pretty loose to let preheated air really wrap around the botanical; you get a richer vapour experience, but one that doesn’t last as long as if you pack more firmly. But when it loose, you usually don’t have to stir at all, and when you’re finished, you can take the stem out while it’s still warm and simply tip out the spent material. Speaking of the stems, the borosilicate glass stems are great for storing a couple of sessions for the road using the handy carrying case, and impart nothing to impact the vapour purity. The Air II is a very respectable unit that I really like as the next and better generation of a classic Canadian vaporizer. Excellent battery life, precision, great looks, easy use, superior performance and great portability keep Arizer and the Air II at the top of the pack when it comes to portable vaporizer excellence. Arizer backs the Air II up with a 2 year general warranty against flaws in materials and workmanship, and the convective heater is covered for life. For life…that’s confidence. We’ll have lots in stock very soon, and will be offering them at the best prices in the country.